The Pentax 35mm f2.4 SMC DA AL Lens offers a natural perspective similar to that of the naked eye, making it versatile enough to be used with a wide range of subjects and applications. The unifocal design also provides other benefits, such as the ability to throw the background out of focus, and to reproduce high-resolution images with edge-to-edge sharpness. 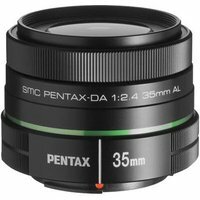 The Pentax 35mm f2.4 SMC DA AL Lens is the perfect choice for digital SLR beginners to familiarise themselves with the basics of using interchangeable lenses.